Balance surely is important. There is a time for direct instruction, but many learners would tell you outright that this component of a lesson is not what they really crave or find meaningful. In Learning Transformed Tom Murray and I examined research and evidence to conclude that kids want a learning experience that is personal while educators want alignment with the real expectations placed on schools across the world. Finding common ground in this area at times poses quite the challenge. 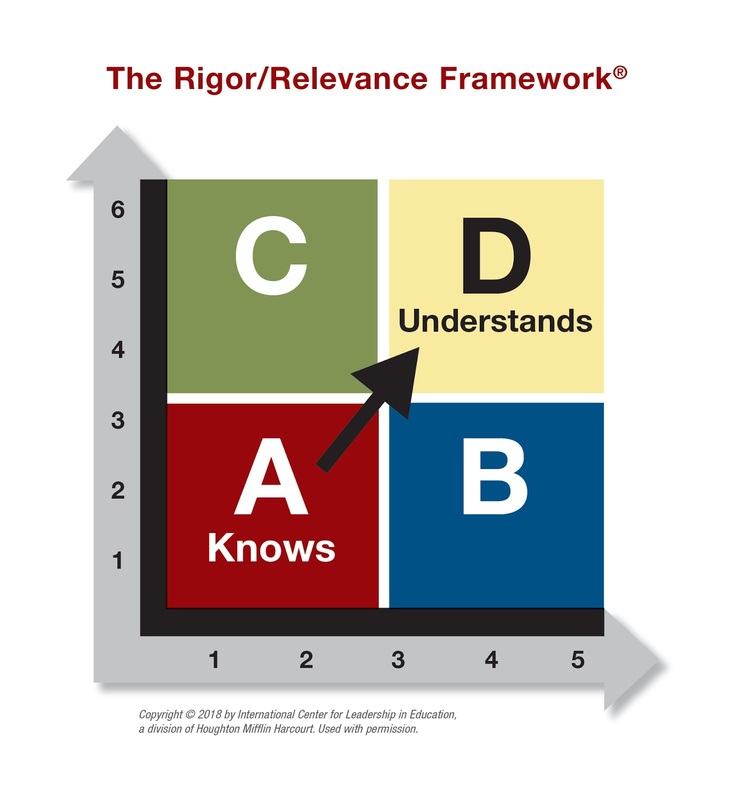 Any personalization necessitates a move from “what” to the “who” to emphasize ownership of learning. Sounds simple enough right? Getting everyone on board becomes the challenge. 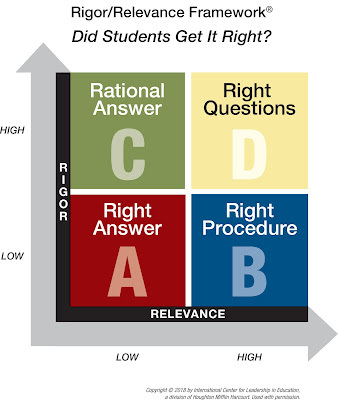 Make the shift to personal learning goes right back to finding the right balance between instruction and learning. Success in this area requires a shared vision, language, and expectations that not only make sense, but also jive with curriculum, standards, and assessment. 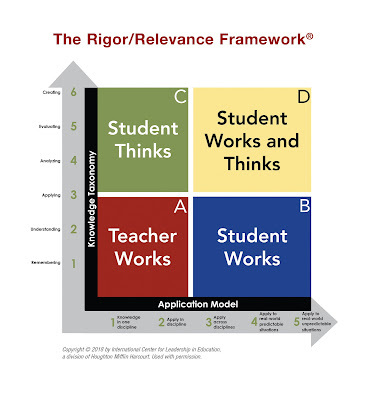 Enter the Rigor Relevance Framework. Now I am not going to rehash the details of this tool as I have been writing about it for years, but I will provide an image of it below. The essence of the framework is quite simple as it allows for a lens for teachers and administrators to determine the level of thinking and relevant application that kids demonstrate while engaged in the process of learning. Instilling a purpose of learning while challenging all kids in the learning process is at the heart of a more personal approach. Solid instruction should lead to great learning where kids are in the proverbial driver’s seat. The Rigor Relevance Framework unearths three critical shifts in practice that can lead to personal learning experiences for kids. As I love using images to articulate ideas and concepts, I will frame each shift with a question that will then be described in more detail using an associated image. 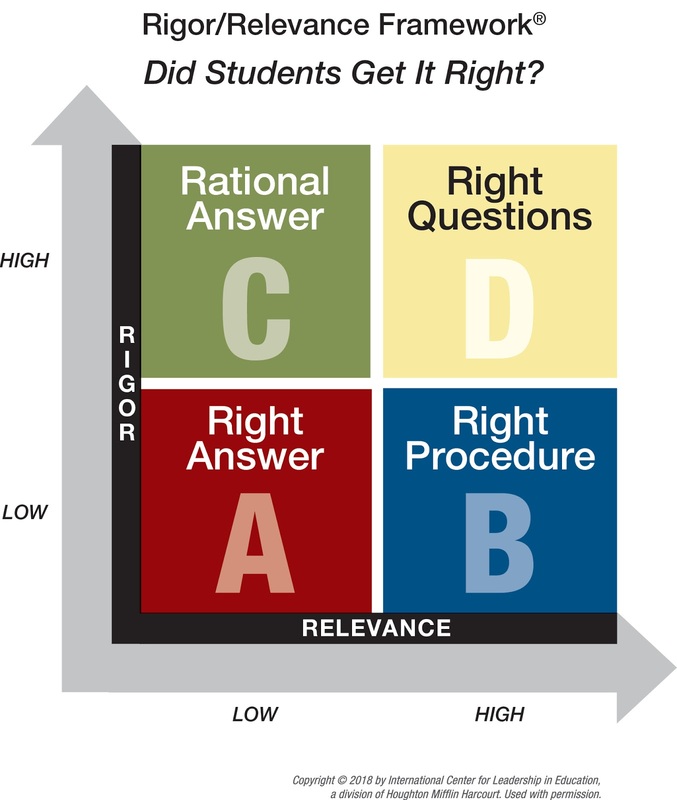 Shift 1: Are learners telling us what they know or showing that they actually understand? Shift 2: Who is doing the work and thinking? Shift 3: Who is asking the questions? There is obviously more to consider when embracing and implementing the shifts listed above. A personal learning experience doesn’t sacrifice higher-level thinking and application just for the sake of relevance and meaning. Sound pedagogy lays the foundation with an added emphasis on scaffolding, innovative assessment, and improved feedback. Student agency and technology both play a huge role throughout by empowering learners through choice, voice, and advocacy. When these are combined to create effective blended learning activities in flexible spaces, the added elements of path, pace, and place further influence the personalization that will help kids flourish regardless of zip code or label. However, it is the third shift that tells the tale as to whether a lesson or task supports rigorous and relevant learning to create a more personal experience for kids. If kids see and understand the purpose while being challenged, then they will be asking the questions. Better outcomes rely on transforming practice in a way that kids of the present and future can relate. Making learning personal is a means to this end.